Voices: Craig T. Nelson, Holly Hunter, Samuel L. Jackson, Jason Lee, Wallace Shawn, Lou Romano, Elizabeth Pena, John Ratzenberger, Brad Bird. Pixar have had numerous heroic characters throughout their animations but here, director Brad Bird introduces us to a full-blown superhero story. When Mr. Incredible (Craig T. Nelson), catches a jumper who doesn’t want to be saved, he opens the door to a wave of legal compensations that puts all superheroes out of business and into a relocation programme. Years later, Mr. 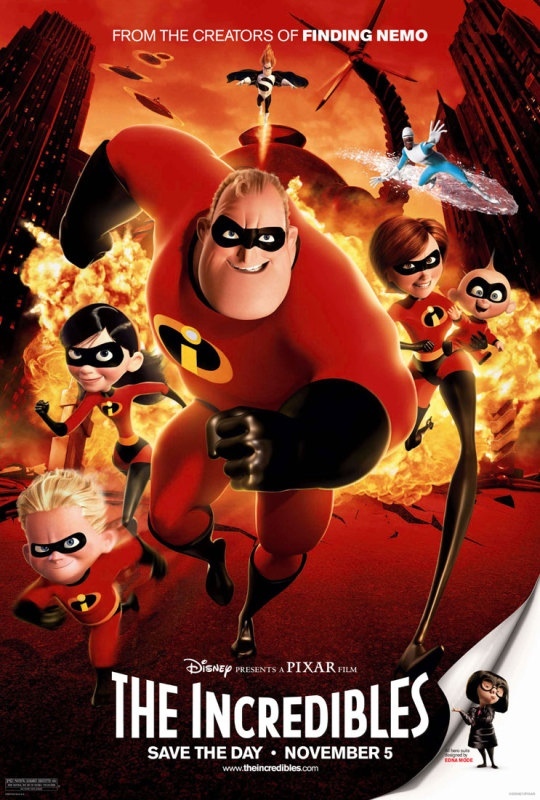 Incredible, real name Bob Parr and wife Helen (Holly Hunter) – formerly Elastigirl – are trying to raise a ‘normal’ family when they receive a mysterious call for help, bringing them back into their crime fighting ways to save the world. An interesting take on a similiar story covered by “Watchmen”, whereby superhero’s are resigned to living a normal life and attempting to fit into society, despite the superhuman powers they possess. The animation is second to none in the Pixar catalogue and it’s refreshing to have a cartoon with human characters as the main focus. There’s no cuddly sidekicks or talking animals, it’s all from the (human) heart this time, which is quite a brave change of direction for a Disney film. 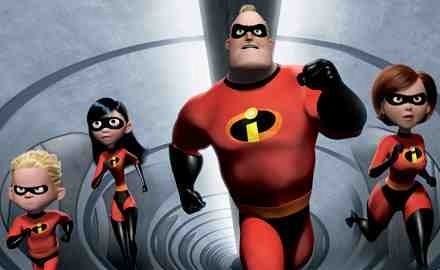 Thankfully for us though, it’s a winner and ranks as one the best that Pixar have produced. Great voice cast also, Nelson and Hunter are perfectly suited to their characters, as is Samuel L. Jackson as their sidekick ‘Frozone’ and Jason Lee as the evil nemesis ‘Syndrome’. They are all warm, humourous and believably written. A bit overlong for younger viewers but bags of fun, once again, from the Pixar team. A real treat. This entry was posted on January 27, 2012 at 9:15 pm and is filed under Action, Animation, Family, Fantasy with tags 2004. You can follow any responses to this entry through the RSS 2.0 feed. You can leave a response, or trackback from your own site.